Definition at line 632 of file detect.h. Definition at line 646 of file detect.h. Definition at line 648 of file detect.h. Definition at line 645 of file detect.h. Definition at line 647 of file detect.h. Definition at line 634 of file detect.h. Definition at line 635 of file detect.h. Definition at line 642 of file detect.h. Definition at line 657 of file detect.h. Definition at line 650 of file detect.h. 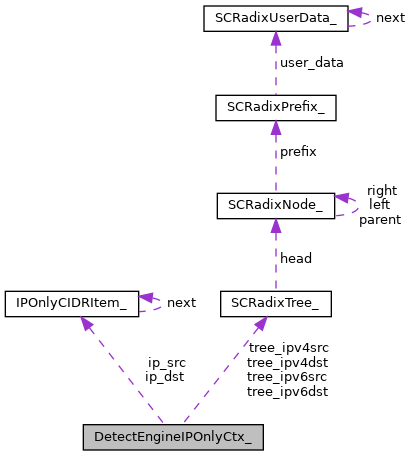 Referenced by DetectEngineIPOnlyThreadInit(), IPOnlyAddSignature(), and IPOnlyCIDRListFree(). Definition at line 656 of file detect.h. Definition at line 652 of file detect.h. Referenced by IPOnlyAddSignature(), IPOnlyDeinit(), and IPOnlyInit(). Definition at line 653 of file detect.h. Definition at line 638 of file detect.h. Referenced by IPOnlyDeinit(), IPOnlyInit(), and IPOnlyMatchPacket(). Definition at line 639 of file detect.h.